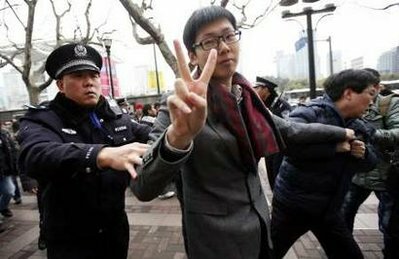 Student protester arrested at a "strolling" action in Shanghai. One of the leading figures in this struggle is 28-year-old Gaius Gracchus (as he is known online). After being imprisoned in China for speaking out and seeking asylum in the United States, Gaius studied classics at Columbia University. He’s now president of the Chinese Youth Foundation (CYF), whose members are located both in China and internationally—in Paris, Seoul, Hong Kong, Australia, and the United States. At his apartment in New York, Gaius and I talked about what he’s doing to stay one step ahead of a government determined to stop him. “I want to promote social justice and community cohesion, and prepare the next generation of intellectuals who can champion human rights in China,” he explains. The social conditions in China are rapidly deteriorating. “People in my generation cannot find jobs, mortgages, or housing,” says Gaius. “Inflation is very high. Prosecuted people appeal in vain. Very few have access to good quality education and healthcare, and the state security apparatus is violently repressive. A culture of ‘you get it if you can pay for it’ is dominant in China.” People across the country yearn for change and are constantly venting their anger. Gaius has learned that, in 2010 alone, there were over 320,000 incidents of civil unrest across the country. Security forces often subdue such unrest violently. In the city of Guangzhou this past May, for instance, after three people were killed by local police, three days of mass protest ended when the army killed over 100. Around the same time, in the Inner Mongolia, peaceful protests against the exploitation of natural resources were also brutally suppressed by the army. The CYF aims to bridge these divides by branding such mass incidents with the symbolic identity of the Jasmine Revolution, using articles and imagery on a variety of websites. They’re deliberately borrowing the language of “Jasmine Revolution” from the successful uprising earlier this year in Tunisia. The effort has met with some success. When a recent strike by truck drivers in Shanghai was tagged online in this way, the government gave into the demands of the drivers within three days, reducing working hours and increasing wages. Another novel tactic the CYF employs are the weekly online “strolling” actions, announced on its blog at molihuaxingdong.blogspot.com. “The strolling announcements consist of a round-up and analysis of the latest protest incidents in the country, supplemented by pictures and videos, along with the designation of a ‘strolling’ site,” Gaius says. When a strolling announcement is branded as part of the Jasmine Revolution, the government sends police units to the designated location to suppress it. What they find is a crowd of people wandering around a marketplace or a square, minding their own business. Government resources are wasted through such deployments, Gaius believes, making the regime look foolish. Afterward, news of the incident circulates on the web and becomes part of daily conversation in China. Journalism itself has become one of his tactics. “My colleagues and I use our connections with local authorities, journalists, and activists to create reports on the practices of government officials and institutions for anonymous online publication,” Gaius explains. A report by his group exposed the involvement of authorities in Sichuan province in an embezzlement scam, where money was being siphoned from a redevelopment fund established after the 2008 Sichuan earthquake. (Ai Weiwei, the artist recently released from custody, also helped publicize these findings.) A few days after the release of the report, an investigation was initiated by the Chinese Central Committee on Discipline and Investigation that found three mayors in the province guilty of corruption. Even as the Great Firewall of China prevents most internet users inside the country from seeing anti-government websites, the bureaucracy behind it is unable to keep up with young tech-savvy activists like Gaius. For example, Gaius and his colleagues use a Google application which constantly generates a unique code that allows them to securely access and manage their emails and websites. But the government is also constantly revising its countermeasures. “After the Shanghai protest, truck drivers in the cities of Ningbo and Suzhou went on strike hoping for similar results,” he says, “Even after they were tagged online, the government accepted some demands but then dispatched the police to infiltrate the protest groups and arrest the organisers.” The regime also uses alienation tactics against individual protesters, denying them job opportunities and social services, and arresting them with accusations of being foreign agents. The tactics being used by Chinese activists who may be learning from this diaspora-based dissident are very innovative — so much so, that it’s evidence of why “training in protest strategies” by “Western leaders” isn’t necessary. In fact, the Chinese regime and virtually every other authoritarian regime now being opposed by nonviolent protesters or movements would like the world to believe that they’re “trained” and inspired by Western governments, in order to undercut the truth that they spring from local grievances and discontent. The reality is that external assistance has never been the decisive factor in successful use of civil resistance to win rights and freedom, and its role shouldn’t be overrated — especially in an era when the knowledge of how to resist is readily available via the internet, social media and other sources (including “Waging Nonviolence”). Thanks, Tom—I think that’s right. It often seems to be the case that movements with an uphill battle ahead of them find themselves asking, “Where is the United States?” It’s an odd consequence of the hubris of US foreign policy: because we (Americans) think we can do anything we like, people elsewhere start thinking that we can do anything we like to. But the truth is we can’t. The more we get involved, the more likely things are to backfire. Preferable is, yes, exactly what we’re trying to create on this site: an international network of conversation—even solidarity—among activists and scholars who are learning by doing in their various circumstances. Gaius’s language is interesting: “drive Chinese citizens to shed their fear and collectively become agents of change.” Nobody, I suspect, can “drive” someone else to shed their fear. The shedding of fear is ultimately something one must do for oneself. i am looking for a way to contact gaius. would be great, if anybody can help. if its not possible to post his mail for some reason please forward mine freedom (at) whywefight (dot) net. This is a fascinating article. Would you please develop more on the “strolls” and spell out how they constitute “protests”, how do people find out about them, etc. These tactics are extremely courageous, innovative and empowering — and we in the U.S. need to learn from them. But that does not mean that the larger strategies are free of contradiction. In the last paragraph, one of the organizers is asking for support from western governments, which I’m sure the CIA would be all-too-eager to provide. How to resolve this dilemma?